Easy Green Tips for Kids! | What's Green with Betsy?!? « Turn Your Kitchen Waste Into Gold! Easy Green Tips for Kids! 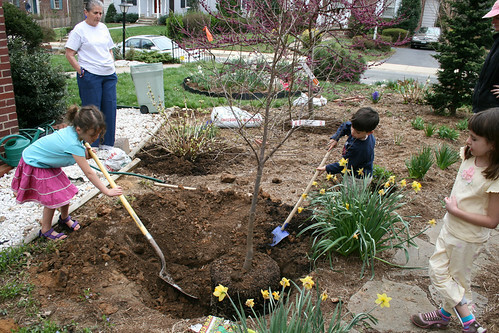 It’s never too early for kids to make environmentally responsible practices a part of their daily life. To protect the future of the earth, kids must get involved. That’s how change happens. Below are simple, money-saving, kid-friendly ideas that make a difference. Start recycling and encourage your friends to recycle too. Start composting kitchen waste and encourage your friends to do so too. Buy green school supplies – pencils, notebooks with recycled paper and reuse last year’s unfinished notebooks. Walk, carpool or take a bus to school to cut down on carbon emissions. Save water by turning it off when brushing your teeth. Turn off video games and computers when not in use. Better yet,cut down on video game time, which uses more energy than computers or tv. Play outside instead. Use rechargeable batteries in your toys and buy well-made toys that last. Plant a little garden – lettuce and radishes are quick, easy to grow crops. Reduce use of throwaway cups, plates, utensils and use washable dishes and cloth napkins instead. Use reusable, BPA-free water bottles instead of plastic ones. Use a recyclable or reusable lunch bag and put your snacks in reusable containers rather than buying small, throwaway ones. Click on the link below to watch a brief video created for children on the importance of recycling and the positive effects of doing so. Great tips one and all, Betsy. Yes, they certainly are applicable to everyone! thanks….